In June 2017, a salvage excavation was conducted along Piqud Ha-Merkaz Street in Jerusalem (Permit No. A-8022; map ref. 221630–722/632559–645; Fig. 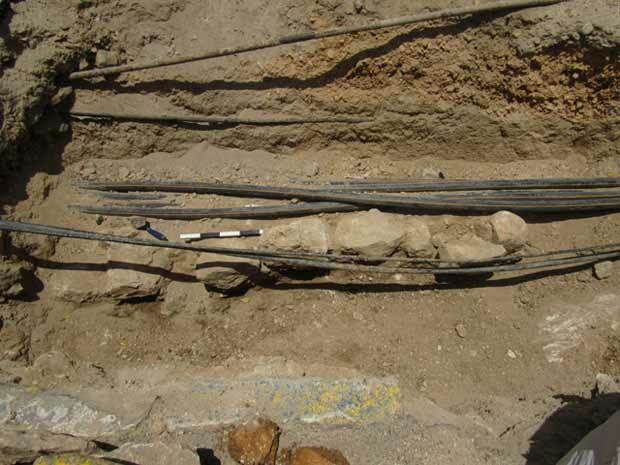 1), prompted by damage caused to antiquities while installing communication lines. 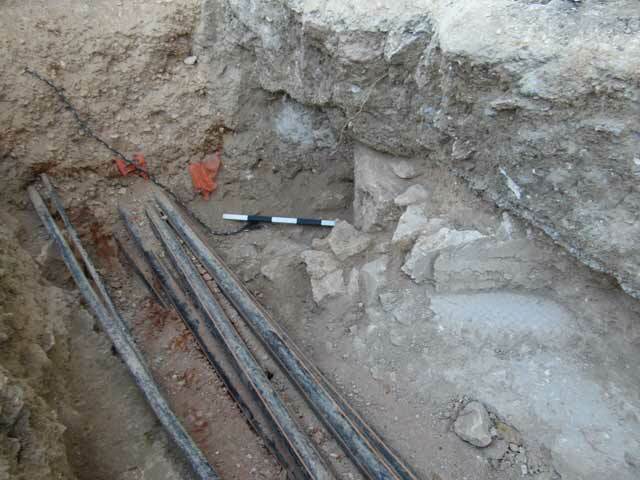 The excavation, undertaken on behalf of the Israel Antiquities Authority and financed by the Dor‘ad Company, was directed by D. Gellman, with the assistance of N. Nehama (administration), A. Peretz (photography), B. Touri and N. Sanduka (trial excavation), R. Abu-Diab and S. Freireich (mosaic conservation), L. Di Segni (epigraphy), D. Tanami (metal detection), A. Hajian and N. Zak (surveying and plan), I. Lidsky-Reznikov (pottery drawing), A. Reznitsky (coin cleaning), D.T. Ariel (numismatics) and I. Ktalav (mollusks). Several previous excavations conducted near the excavation site had identified traces of quarries from the first century BCE, remains of Jerusalem’s first-century CE Third Wall, Roman-period tombs and a complex of buildings dating from the Byzantine to the Early Islamic periods, including a courtyard, churches, tombs, a bathhouse and monasteries (Tzaferis et al. 1992; Amit and Wolff 1993; Feig 1993; Amit, Wolff and Gorzalczany 1995; Shukron and Savariego 1995; Tzaferis, Amit and Sarig 1996; ‘Adawi 2005). 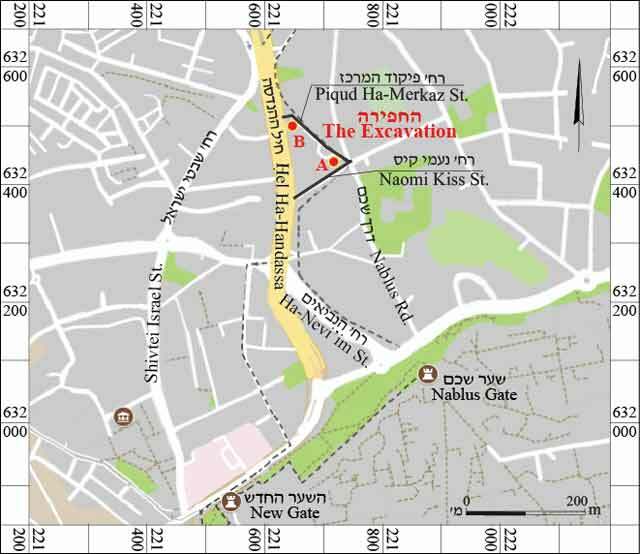 Two excavation areas were opened along Piqud Ha-Merkaz Street: a southern area (A; map ref. 221711–22/632559–69), between the Paz gas station and the US consulate building, near the intersection with Naomi Kiss Street, and a northern area (B; map ref. 221630–4/63241–5), near the northern end of the street. Area A yielded remains of a mosaic floor and a scant remnant of a wall belonging to a Byzantine building. The remains unearthed had been severely damaged by modern infrastructure work. Much of the floor was damaged and in many places the side of the building was not preserved. 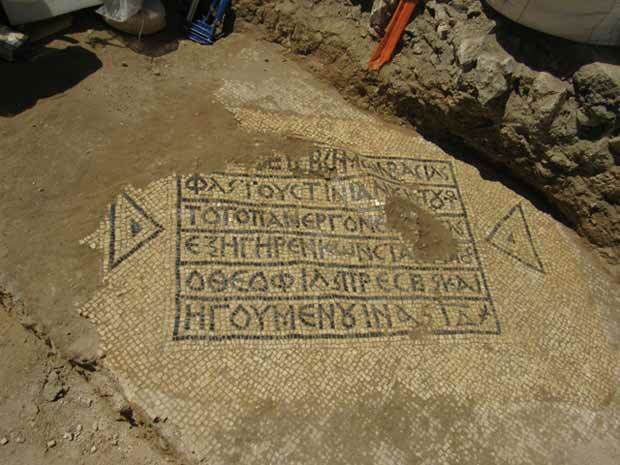 Nevertheless, the mosaic contained a well-preserved dedicatory inscription in Greek that dates the building to the mid-sixth century CE (Di Segni and Gellman 2017). Area B yielded a few remnants of a field wall, with no context and no diagnostic finds. Area A (Fig. 2). 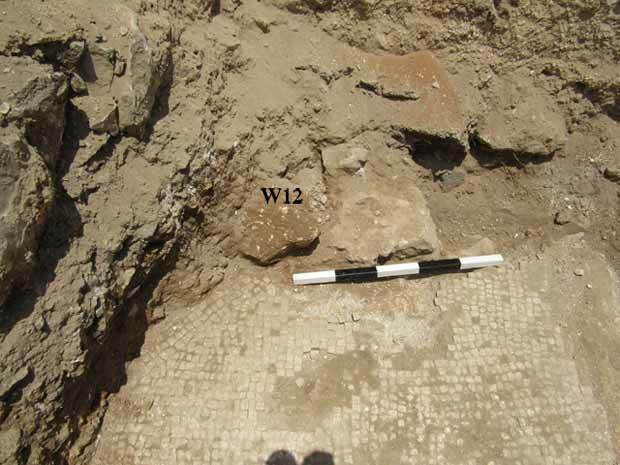 The excavation uncovered remains of a mosaic pavement (L3, L10) made of white tesserae (average density 32 per sq dm) aligned northeast–southwest and set in a plater bedding (L4, L8; Figs. 3, 4). At the northern end of the excavation area were scant remains of a wall that enclosed the building on the north (W5, W12; Figs. 3, 4). Three rows of tesserae that were laid at a 45-degree angle to the rest of the mosaic floor abut W12. The floor also abuts this wall (W5), which was coated with plaster; a second layer of plaster (W6) was identified over the first layer. 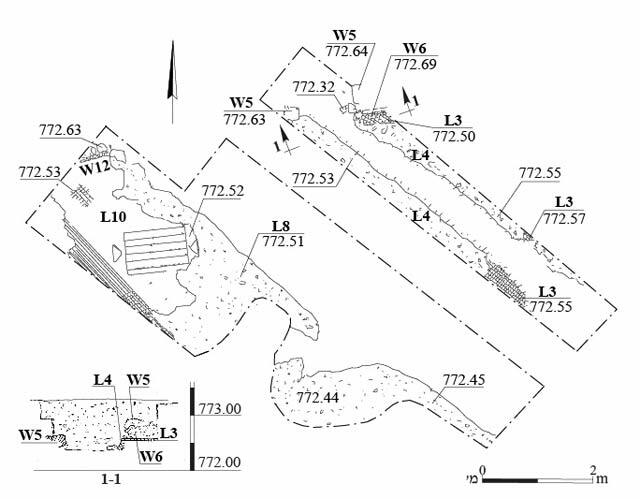 A few tesserae set in a different alignment were found near the southeastern end of the excavation (L3); they probably represent the southern end of the building. The location of the remains of the mosaic floors and the orientation of the tesserae suggest that the room was at least 9 m long (east–west). A southward-facing Greek inscription, made of black tesserae (average density 44 per sq dm), was unearthed near the northwestern end of the excavation area. The inscription consists of six lines enclosed within a tabula ansata (length 1.14 m, width 0.8 m; Fig. 5). It is a dedicatory inscription recording the date of the building’s construction, in the 14th indiction (tax year) during the reign of emperor Justinian—apparently 550/1 CE. The inscription also mentions Constantine, the abbot in charge of the building. Following the removal of the inscription, the material sealed beneath it was excavated. The plaster bedding yielded a coin which could not be identified, and the soil fill beneath the plaster—three coins, whose state of preservation allowed for only tentative identification based on size and shape to the first half of the sixth century CE. A few potsherds were also found, including arched-rim basins from the Late Roman–Byzantine periods (Fig. 6:1) and a Late Roman storage jar (Fig. 6:2). The Byzantine period was represented by Phocaean Red Slip bowls, Type 3 (Fig. 6:3–5) and roof tiles (Fig. 6:6). The coins and the pottery suggest that the building was constructed no earlier than the mid-sixth century CE. The excavation also recovered two shells from the Mediterranean Sea: one belongs to the Donax trunculus species, which was used as a food and has been found at several Byzantine sites, and the other is an example of Glycymeris nummaria, which was picked up along the seashore. Late Roman–Early Islamic potsherds were found in the accumulations above the remains of the floor. The Late Roman–Byzantine finds included a stand (Fig. 7:1), bell-shaped lids (Fig. 7:2) and arch-rimmed basins (Fig. 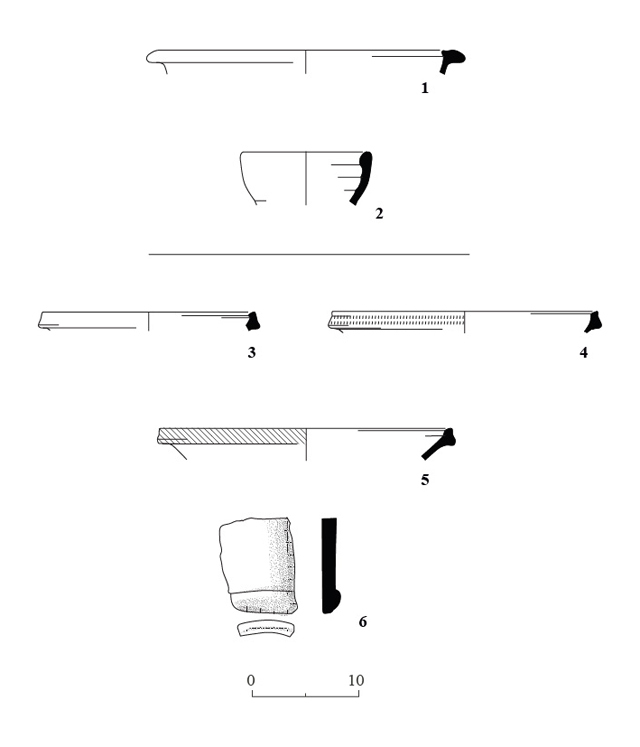 7:3, 4); the Byzantine-period finds included Fine Byzantine Ware bowls (Fig. 7:5, 6), roof tiles (Fig. 7:7), oil lamps (Fig. 7:8) and cooking pots (Fig. 7:9); Early Islamic oil lamps were also identified (Fig. 7:10). A cluster of small fragments of iron artifacts, possibly pieces of a single item, was found about 2–3 cm above the floor. The finds above the floor are mixed and thus cannot be used to date the abandonment of the building with any certainty; the soil fill may have been brought here from an adjacent area during infrastructure work. Area B. A row of stones, one course high and one stone wide, was unearthed (Fig. 8). No diagnostic finds indicating a context or a date were recovered. The building remains were probably part of a complex of religious buildings located along the main road, at the entrance to Jerusalem. ‘Adawi Z. 2005. Jerusalem, near the Third Wall. HA-ESI 117. Amit D. and Wolff S. 1993. Excavations at an Early Armenian Monastery in the Moresha Neighborhood of Jerusalem. Qadmoniot 101–102:52–56 (Hebrew). Di Segni L. and Gellman D. 2017. A Justinian Inscription North of Byzantine Jerusalem, and its Importance for the Dating of the Nea Church Inscription. In Y. Gadot, Y. Zelinger, K. Cytryn-Silverman and J. Uziel eds. New Studies in the Archaeology of Jerusalem and its Region: Collected Papers 11. Jerusalem. Pp. 27*–37*. Feig N. 1993. Excavations at the Third Wall. Qadmoniot 101–102:48–52 (Hebrew). Shukron E. and Savariego A. 1995. Jerusalem, the Third Wall (Area C). ESI 13:78–79. Tzaferis V., Onn A., Feig N., Rapuano Y. and Weksler S. 1992. Jerusalem, The Third Wall. ESI 10:130–133. Tzaferis V., Amit D. and Sarig N. 1996. A Byzantine Painted Tomb North of Damascus Gate, Jerusalem. ‘Atiqot 29:71*–75* (Hebrew; English summary, pp. 112–113). 3. Remains of the mosaic pavement on top of a plaster bedding abutting a stone wall with two plaster layers, looking north. 4. Remains of the mosaic pavement on top of a plaster bedding abutting a stone wall, looking northeast. 5. Dedicatory inscription in the mosaic pavement, looking south. 6. Pottery from beneath the floor (L11). 7. Pottery from above the floor (L7, L9). 8. Area B, row of stones, looking northeast.